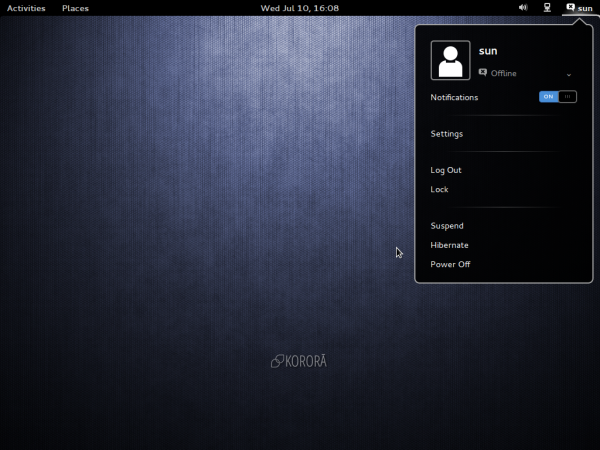 Korora is a Linux distribution that is based on Fedora. 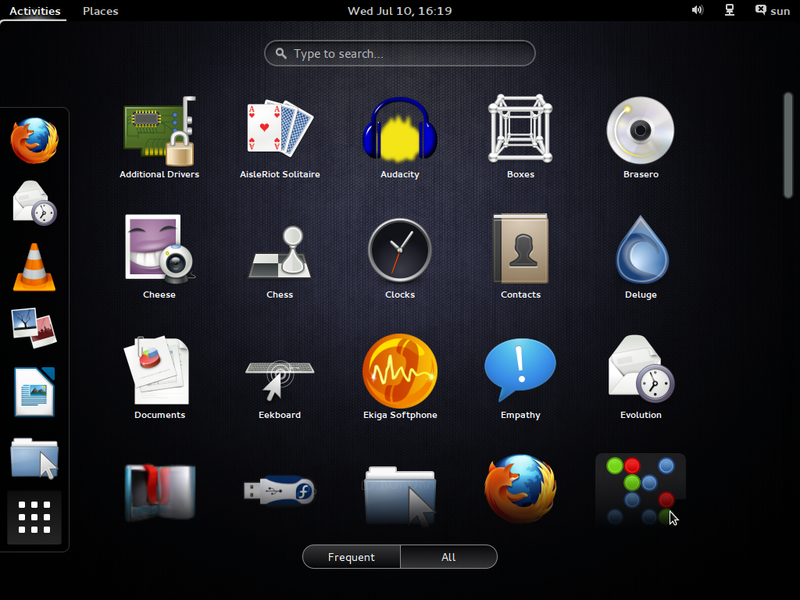 Korora 19, code-named Bruce, which is based on Fedora 19, was released the day after its parent distribution was released. That’s a little more or less than 24 hours after Fedora 19 was released. 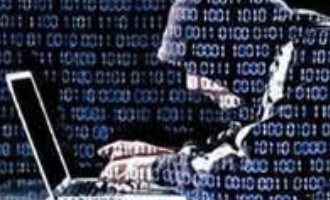 Which means that the Korora developers did not conduct any testing of their own before making Bruce available for download. What that gives you are all the good features, bad features, and bugs that you’ll get by using Fedora 19 itself, plus some extras. 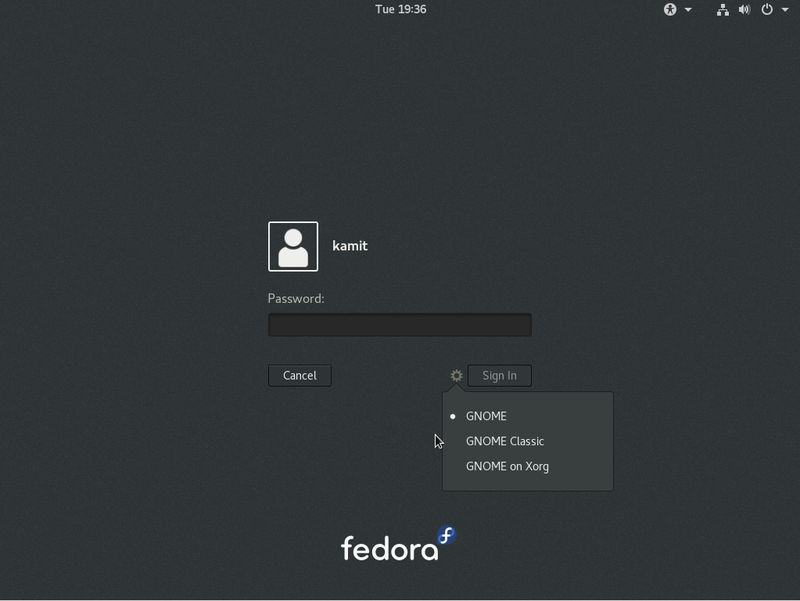 Because official Fedora repositories do not contain non-free or proprietary software, the Korora developers decided to step in and offer a Fedora-based distribution that makes those non-free applications available for installation. That’s a major difference, aside from minor interface tweaks of the default desktop environments. The other difference between a Fedora and a Korora edition is that the Korora project only makes 32- and 64-bit installation images of the KDE and GNOME 3 desktop environments, whereas the Fedora project makes installation images for all the popular desktop environments. Though this is supposed to be a review, it is not going to be anywhere as detailed as the Fedora 19 review, because doing that will just be repeating almost everything I wrote about Fedora 19. So this review will be mostly about those “extras” plus some screen shots. 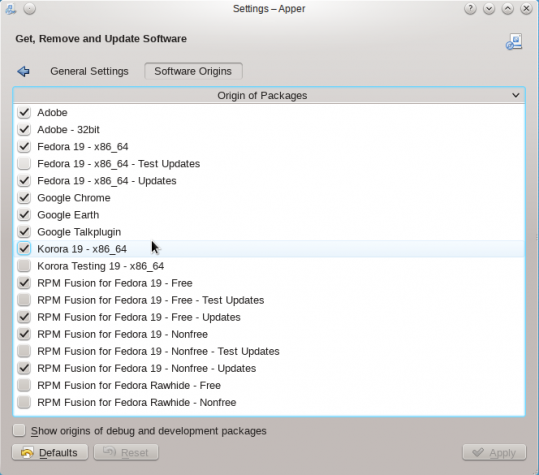 The third-part repos available by default on a new installation of Korora can be seen in the screen shots of the graphical package managers of the KDE and GNOME 3 editions. In Apper, for example, the graphical package manager of the KDE edition, you can see all the available repos. 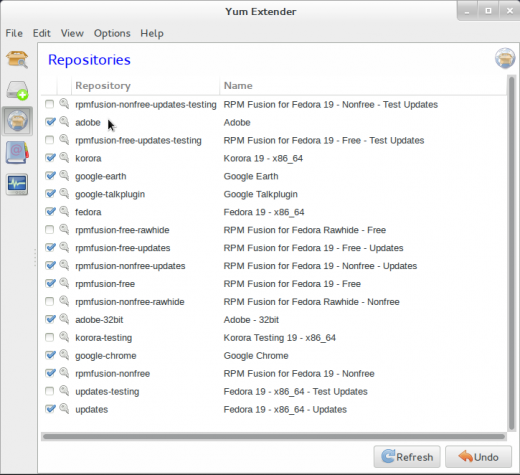 Same goes for Yum Extender, the graphical package manager of the GNOME 3 edition. In practical terms, what these extra repos translate to is that a Korora installation works out of the box. You won’t be spending time adding this repo and that repo just to install and use your favorite application. Adobe Flash plugin, for example, is installed by default, and all the audio and video codecs you’ll need are also installed by default. That’s what Korora brings to the table. But is that enough to start a new distribution? I definitely don’t think so, but that’s the price we pay for the type of freedom we enjoy in the Free Software community. 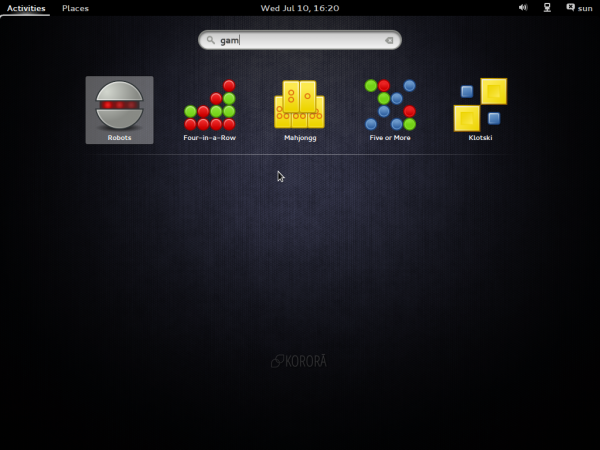 So what does a Korora 19 KDE and GNOME 3 desktop look like? 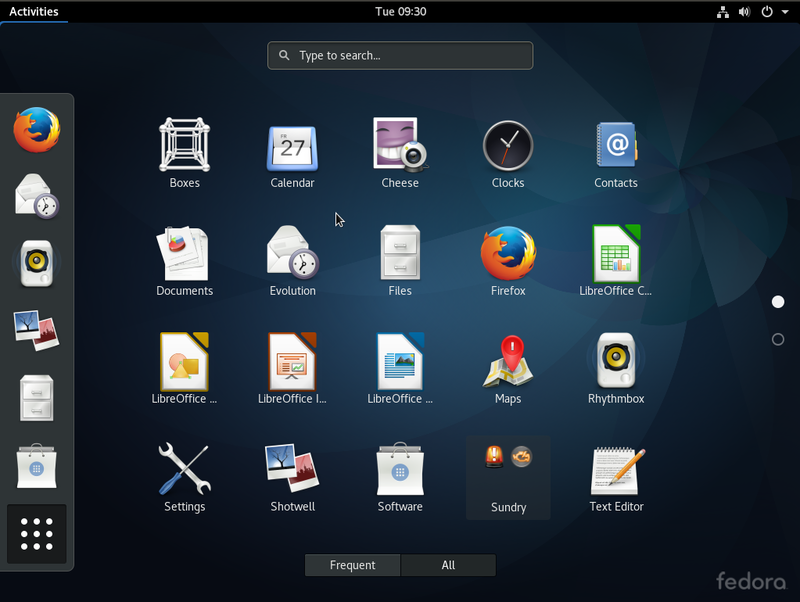 Because of the extra tweaks to the default desktops, the GNOME 3 edition, for example, is a bit more user-friendly than the Fedora GNOME 3 desktop. But even at that, I find that it is not nearly as user-friendly as a GNOME desktop that I can make by using just these two extensions. 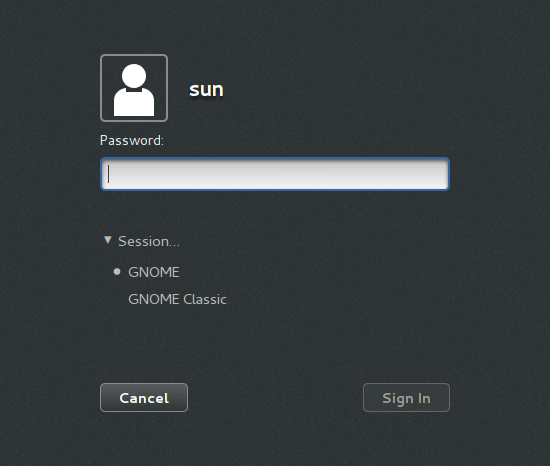 Before we get to the desktop itself, let’s make a brief stop at the login screen (of the GNOME 3 edition). 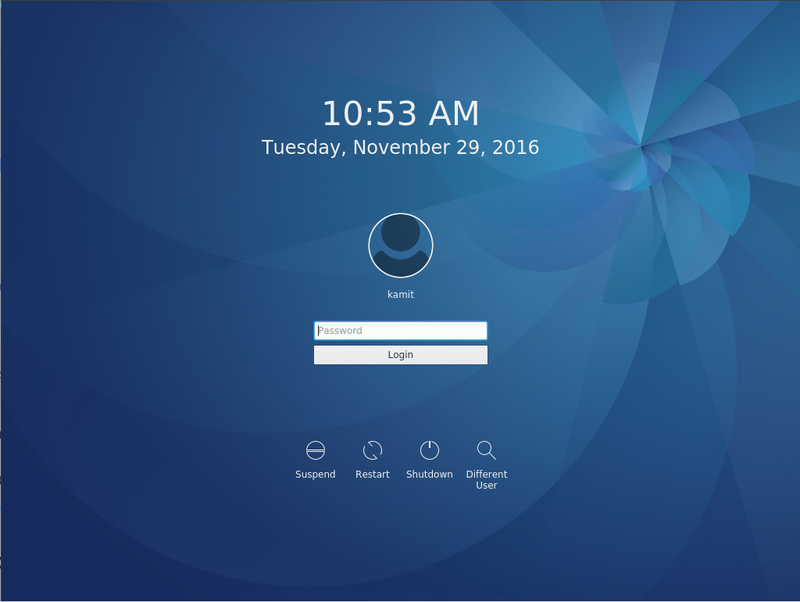 As you can see from this screen shot, you can login to a Korora 19 GNOME 3 desktop using the default GNOME Shell or the GNOME Classic, which is actually not that much different from the GNOME Shell. 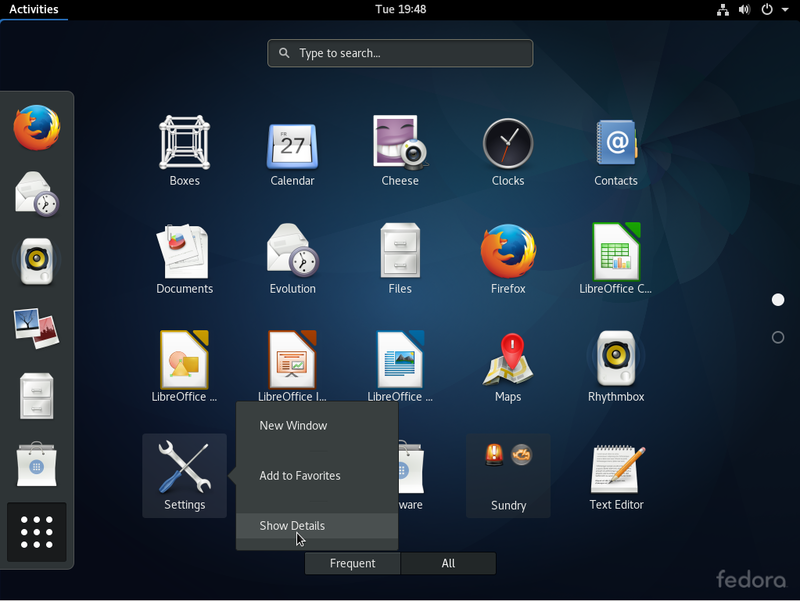 (See GNOME 3 Classic is more of a hybrid desktop.) 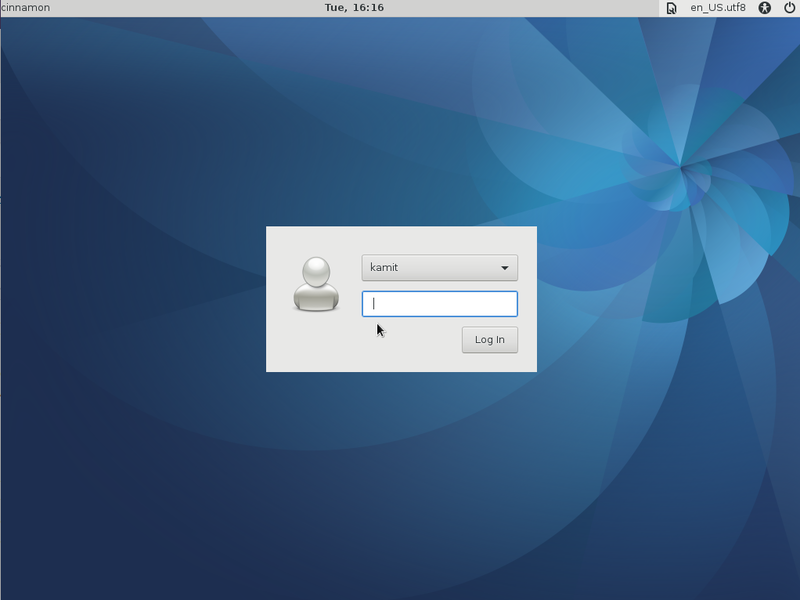 In the Fedora 19 edition, the package for GNOME Classic is not installed by default. Now to the desktop. Aside from the Places menu, and the Suspend and Hibernate entries in the User Menu, it’s not that much different from a default GNOME Shell. And if, like me, you are not into keyboard shortcuts, getting to the app picker view requires a stop at the Activities overview. And the app picker view. 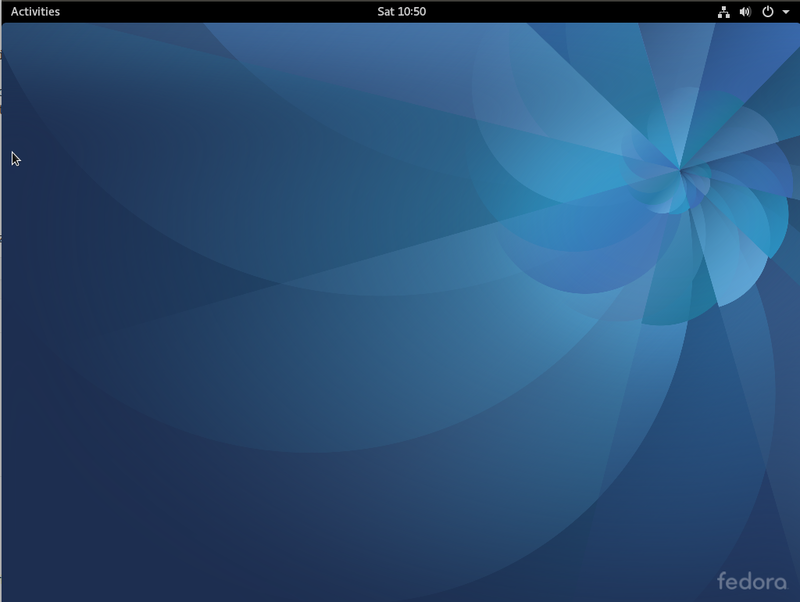 Just like on Fedora on any other GNOME 3 desktop. App-wise, a minor difference between Korora 19 and Fedora 19 is that the former comes with several games installed. There are no games on a default installation of Fedora 19 GNOME 3. 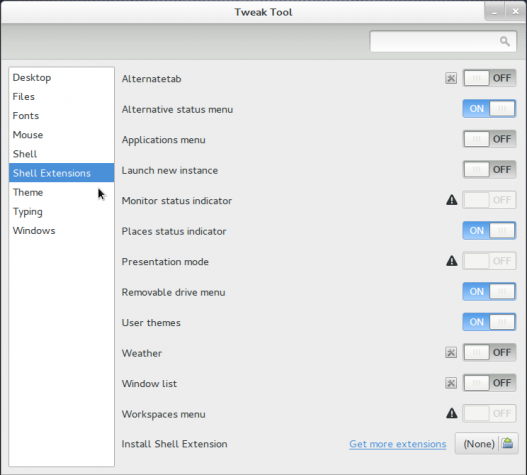 With all the extensions installed, it’s a good thing that the GNOME-Tweak-Tool (GTT), which is used for managing them and other aspect of the GNOME Shell, is also installed. 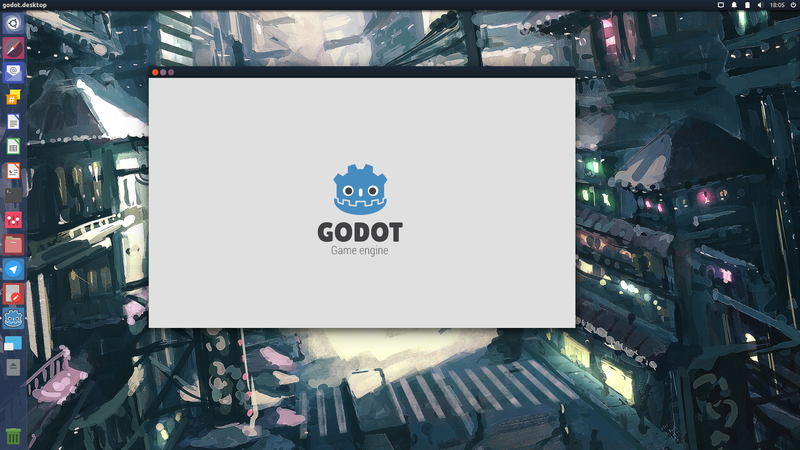 The first thing I had to do after I logged into my test installation of Korora 19 GNOME, was to use GTT to give application windows all the titlebar buttons. Using a desktop where window titlebars lack the minimize button is, for me, not a good idea. One of the point I made in Fedora 19 review is that each Fedora edition seems to have its own graphical package manager. In the GNOME 3 edition, it is the gpk-application, Apper in the KDE edition, and something else in the other Spins. 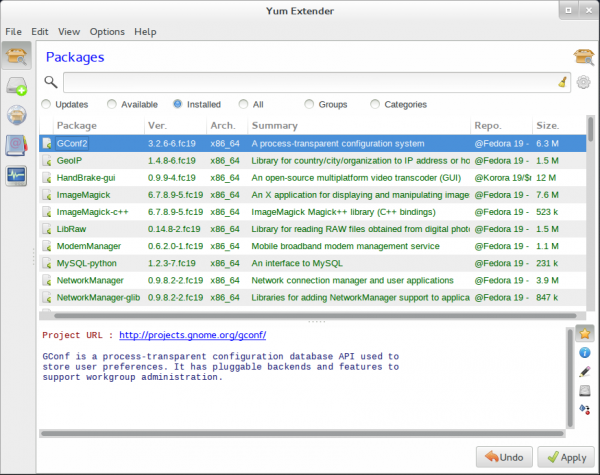 In the GNOME 3 edition of Korora 19, the graphical application manager is the Yum Extender. Given the option of using these graphical package managers or yum from the command-line, I’d rather use the command-line. That’s how bad they are. 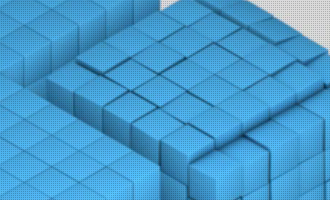 None come anywhere close to the Deepin Software Center of Linux Deepin. One last point about the GNOME 3 edition: I still could not get firewall-applet to start, which is the same problem I had with it on Fedora 19 GNOME. 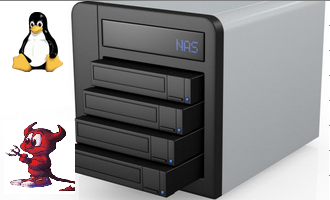 How about the KDE edition? Compared to the GNOME 3 desktop, which is in a fast feature development phase, the KDE desktop looks mature and kinda boring. I’m referring to the mainline KDE desktop, like the one you get on Korora or Fedora, not, for example, the KDE desktop of ROSA Desktop. Like on Fedora 19 KDE, I was able to start firewall-applet. 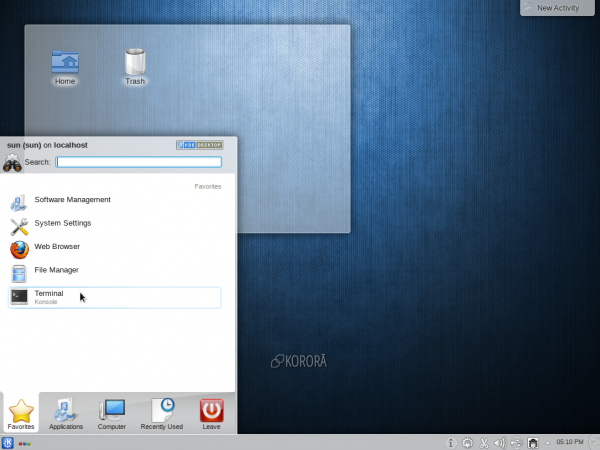 Unlike the Fedora KDE desktop, which featured a full cast of native KDE applications, including using Konqueror as the default Web browser, Korora 19 KDE shipped with a mix of native KDE and non-native KDE applications. For example, Firefox is the default Web browser, which is a far better Web browser than Konqueror. 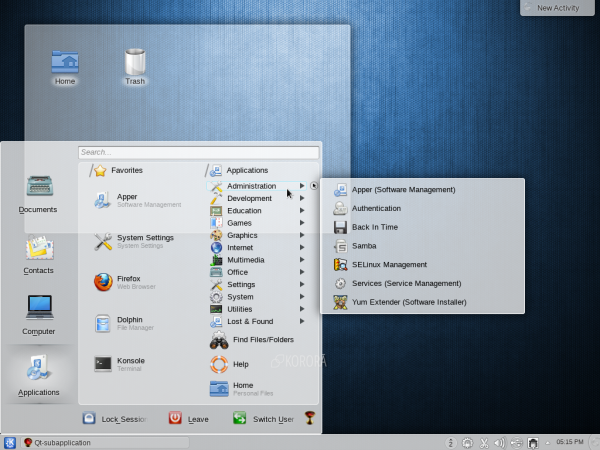 Shown below is a screen shot of the default desktop, with the Kickoff menu. Here’s another screen shot, but showing the Lancelot menu, which is a more user-friendly menu than the Kickoff menu. If you’re too lazy to add third-party repositories to a Fedora 19 installation to make it just work, Korora is a recommended distribution, though for a new user, I’d rather recommend any edition of ROSA Desktop, which has a desktop UI that is more polished than Fedora or Korora. 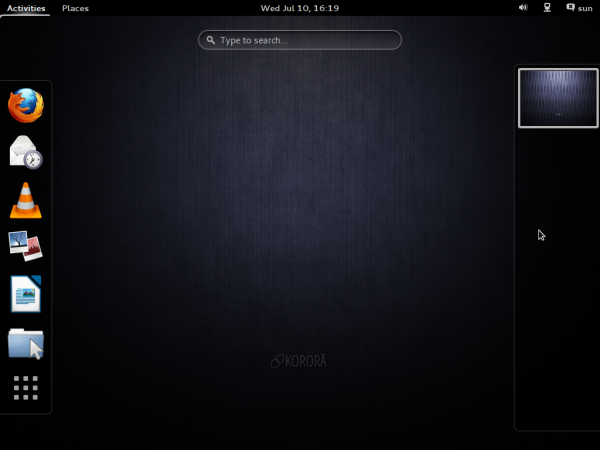 To download KDE and GNOME 3 installation ISO images of Korora 19, visit the project’s download page. Haven’t been able to install Korora-19. I have gigs of space on a 1 Tb drive but the installation keeps showing only 2.5 Mb space??????? finid, I believe what Adam is trying to say is just because Korora has the same bugs as Fedora does not mean that the Korora Devs didn’t test it. I think the Korora Devs would agree that their distro is more of a respin of the Fedora base. Therefore testing was primarily done against the base. Eh? Why would you assume that? Fedora is an open project; they could have ‘conducted testing of their own’ all the way through the pre-release phase. Korora shares the same bugs with Fedora. Bugs that I’ve not experienced on the GNOME 3 edition of ROSA Desktop R1.